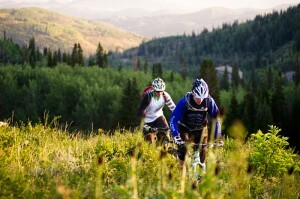 In 2008, IMBA held their World Summit mountain biking conference in Park City. Since then, the wheels have been turning on IMBA’s Ride Center program and on the idea that Park City is an exemplary mountain biking destination. IMBA is the organization that designates trails like Park City’s Mid-Mountain Trail as one of the world’s “Epic” rides, and the Ride Center program offers the equivalent endorsement on a much broader scale. In addition to their advocacy efforts around the world, the International Mountain Biking Association supports dedicated trail building crews that travel across the country each summer. IMBA’s trails crews work with local organizations to teach them how to build sustainable trails and spend time meeting with groups such as local U.S. Forest Service representatives and land owners to discuss land access issues. IMBA ranks locations for possible Ride Center status based on a comprehensive range of criteria including everything from the number of miles of various types of trails to the types and quantities of lodging and restaurants in the area. Not only do they want to know if there are pump tracks and lift serviced riding in town, they also ask about trail head facilities, activities for after the ride, and even if there’s a brew pub in town. One of the benefits of being designated as a Ride Center by IMBA is that mountain bikers looking for the best locations in the world for biking adventures will be able to see Park City’s leading Ride Center status right on the IMBA website. They will even be able to click through and book biking vacations in Park City on the site making IMBA’s Gold Ride Center designation meaningful for local businesses. As head of Mountain Trails, Sturgis agreed the IMBA designation was a point of civic pride and offered the opportunity for more summer and fall business in town, but he pointed out that there was another valuable consideration. “Perhaps one of the things that I’m proudest of with regard to the Gold Ride Center designation is that we will be working with IMBA as the standard bearer for their program. We’ve agreed to host other communities that want to become Ride Centers. We’ll show them what we’ve done and introduce them to people in town who help coordinate all the various aspects that support mountain biking here so they can see how to further biking in their communities. We’ll also be speaking at IMBA conferences across the country and potentially around the world to help further the sport. It’s kind of a cool place to be in, and we’re proud on behalf of the whole community,” noted Sturgis.